Sometimes you see something special and grab your sketchbook, working as fast as you can to capture it. I am at a working ranch in Colorado for a wedding tomorrow and suddenly had a chance to make some rapid line drawings of members of the wedding party cooling off at the pond. The drawings are gesture sketches and I want to develop them by adding color. However, I do not understand the color of the water and hillside here and so began to experiment with pastel and gouache with this sketch from my smallest sketchbook, a 5 by 8 inch Moleskine. The water reflected the trees, hillside, and sky, but also had ripples from the wind, all of which I find puzzling, but want to figure out before adding color to the larger, better drawn sketches. 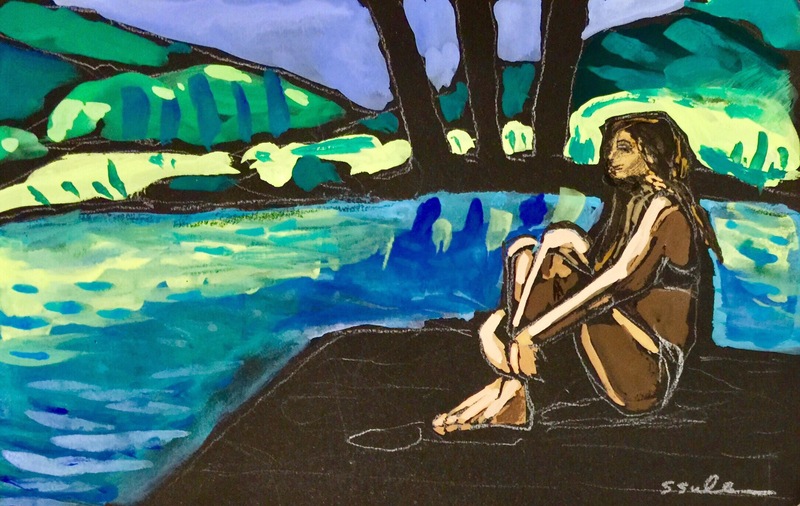 This entry was posted in Deliberate Practice, Landscape, Telling a Story and tagged #WorldWatercolorMonth, Colorado, Gouache, Line, Pastel, Water. Bookmark the permalink.